of each month with exception of December. Mark will not only present some history of the Lucas family and how they founded their business, but will also cover some of the early practices of funeral homes and just how different it is today. Once upon a time there were Phone Books and City Directories where you could look up information on your friends and your community. (And not just for large cities—even small towns.) These directories can yield many details vital to our genealogical research. Come learn where to find them and how to use them. 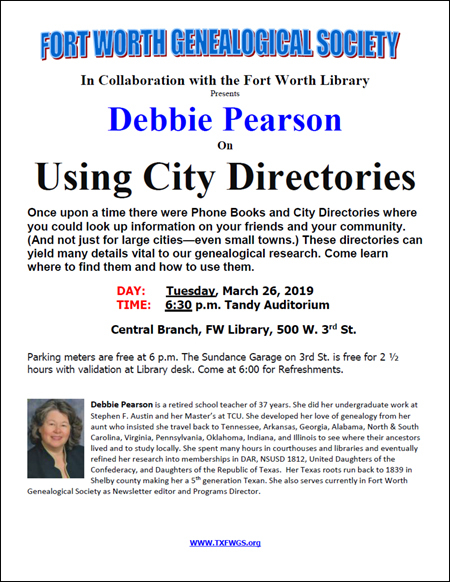 Copyright © 2006-2019, Fort Worth Genealogical Society - All rights reserved. Fort Worth Genealogical Society is a 501(c)(3) organization.